Once again I was spoilt for choice, so have decided to have a pair of Wines of the Week. They are both from different countries and different winemakers, but they are both made from the same grape – Albariño, although neither of them hail from that superb grape’s native country – Spain. The grape originates in Gallicia north western Spain, where it is famously used to make Rias Baixas wines – this is one of the very best you will find. This region is just above Portugal, which also grows the grape and produces superb wines from it, but the Portuguese call it Alvarinho – this is a superb Portuguese example, as is this. Loving Albariño can be an irritating pastime as, like Pinot Noir, it can be so inconsistent and not always show its true beauty, but when it does it truly deserves to be included in a list of the world’s finest white grapes. Lower quality examples can be a bit dilute and lack minerality in favour of peachy fruit, so are always at least nice to drink, but at their best Albariños – like this one here – have poise, balance, purity and a thrilling quality. By the way, if is is consistency that you are looking for with Spanish white wines, then I would recommend that you try a Verdejo from Rueda, this grape never fails to deliver and I wrote about a superb example here. Good Albariño excites me and I have long thought it a shame that it has not managed to break out from the ghetto and become a true international grape variety. However, it seems that this might be about to change as I have recently tasted two really exciting and fine Albariños, one from New Zealand and another from California, neither of them are oaked. Marimar Torres is an amazing lady. 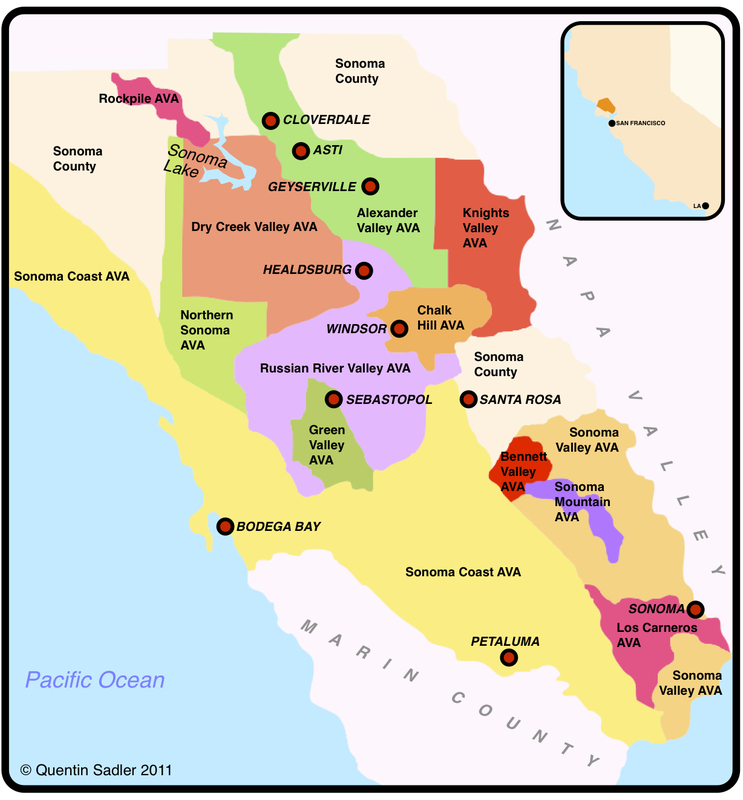 Born into the winemaking Torres family of Spain, she is Miguel’s sister, Marimar carved out her own niche by relocating to California and establishing a boutique winery in Sonoma. The estate specialises in Chardonnay and Noir and the viticulture is entirely organic and moving towards biodynamic. Because of Marimar’s Spanish roots they also grow a little Tempranillo, which she blends with Syrah, and recently have planted a small parcel of Albariño. 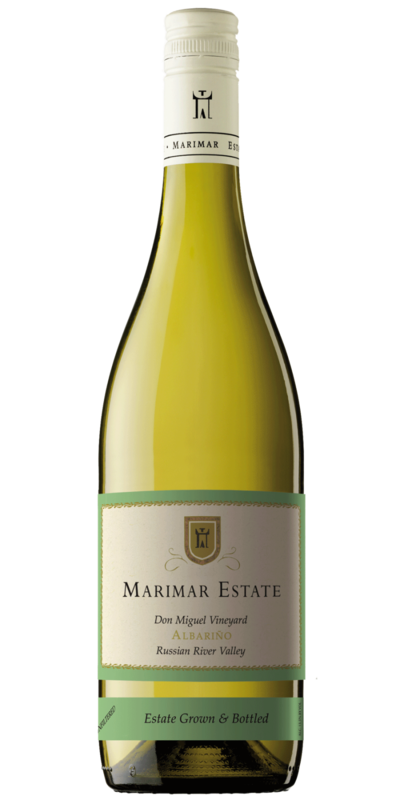 Originally Marimar planted the grape on the cool Sonoma Coast, but amazingly it was too cold for it to ripen properly – it was cooler than Galicia. After 4 years of trying there they gave up and grafted the same vines onto rootstock in their slightly warmer Don Miguel Vineyard in their Russian River Valley Estate. It is a true boutique wine with only 287 cases produced. Albariño is an aromatic grape and the nose is richly exotic and fragrant with floral notes, pineapple, mango and some peach and nectarine too. It isn’t all fruit though, there is even a touch of something saline and mineral there. The palate is quite round, but also delivers lovely acidity to offset the succulent fruit. Lovely concentration of fruit, peach and apricot, even peach stone at times. Touch of white pepper too. Lovely balance and tension between the freshness and the juicy fruit. A glorious wine, subtle and hedonistic at the same time. The finish is dominated by lovely tangy stone fruit and is very long – 93/100 points. Try it with simply cooked fish and a salad, but the sheer weight of this Albariño will suit garlicky chicken well too. Available in the UK for around £28 a bottle from Vintage Marque and Edgmond Wines. Further stockist information is available from Fells. The second exciting Albariño that I have tasted recently is from an equally unlikely place, New Zealand. 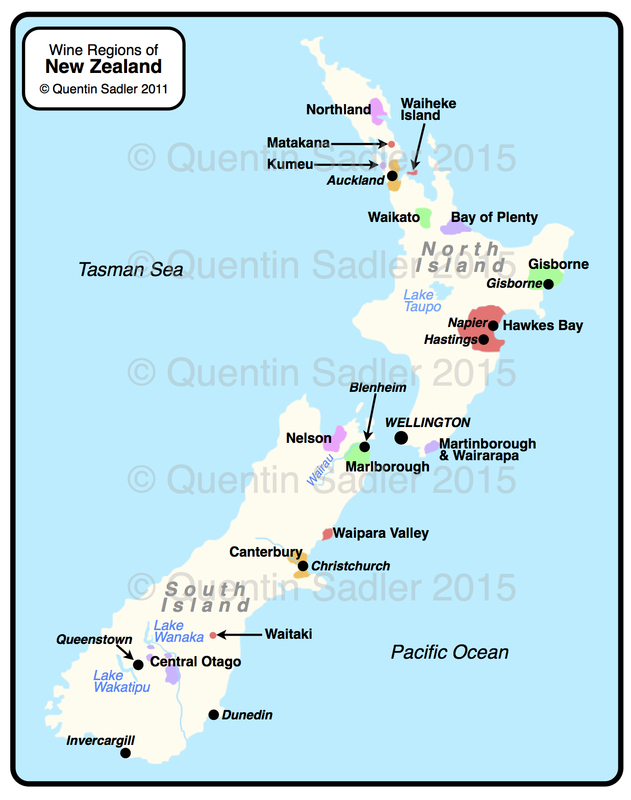 New Zealand wine map – click for a larger view – non watermarked PDF versions are available by agreement. 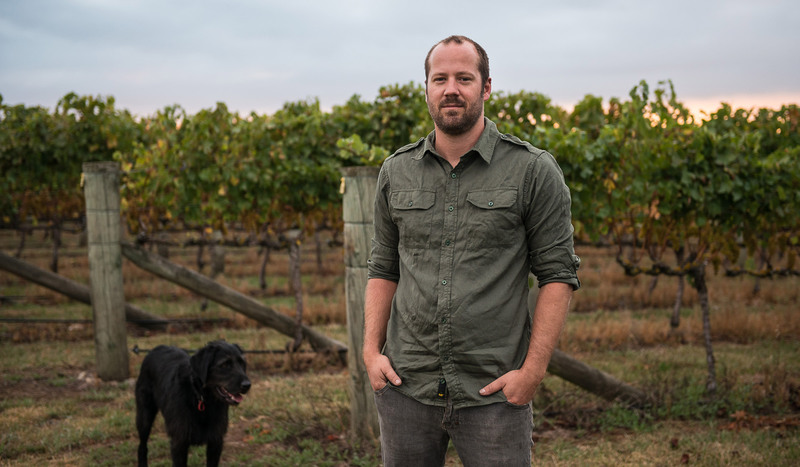 Richard Painter, Te Awa’s talented winemaker. Hawke’s Bay, New ZealandTe Awa is another enterprising winery, this time based in the Gimblett Gravels zone of North Island’s Hawkes Bay region. They produce an exciting range of wines, but also like to show their whimsical side in their Left Field range of less usual grape varieties that are not always grown on their own vineyards. They augment these wines with a wonderfully irreverent set of labels, which you must read. The Albariño fruit was sourced from a small vineyard in Gisborne, which again shows that you do not want too cold a place for Albariño to thrive – Gisborne is pretty warm and is regarded as great Chardonnay country. Again it is an experimental lot with just 250 cases produced. There is a startling purity to this with like juice and pumice notes together with some honeysuckle and orange blossom on the nose. The palate is lean and clean, like a lunge with a foil, with acidity rather than weight to the fore, but the fruit is delicious too, sort of dancing on your senses with delicate flavours of melon, peach and nectarine. Another gorgeous wine and clean as a whistle, grab some while you can – 92/100 points. This lighter, zestier style would suit shell fish and tapas very well as well as all manner of lighter dishes. Available in the UK for around £13 a bottle from Stone Vine & Sun, Taurus Wines and The Halifax Wine Company. Further stockist information is available from Hatch Mansfield. Both these wines are really fine examples of Albariño and show that this terrifically exciting grape is finally on the march.